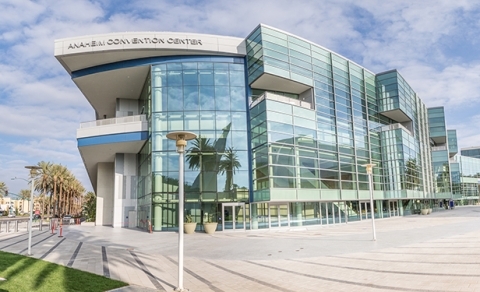 ACC North, the seventh expansion to the Anaheim Convention Center (“Betterment VII”), encompasses 830,000 square-feet and includes two 100,000-square-foot event halls and a 1,350-stall interstitial parking structure. The project’s efficient design transformed a former subterranean parking structure, creating a unique expansion solution that features two levels of parking between the two event hall spaces. Structural designs and innovations maximized use of the subterranean area. More than 13 million pounds of steel and 33,000 cubic yards of concrete were used to create ACC North. Construction of the $190 million design-build project engaged more than 30 trades and as many as 350 workers onsite each day and required coordination with the construction of two hotels, multiple Disney® events, and continuous convention events with as many as 100,000 visitors during the 30-month construction schedule. Faced with a built-out site and the desire to retain existing growing events and adapt to the evolving needs of the meeting and convention industry, the City developed an innovative project solution. Traditional convention venues incorporate three distinct spaces: exhibit areas, ballrooms, and divisible meeting space. In the competitive convention market, empty space is wasted space. Hosting some events may preclude facilities from accommodating concurrent events, and successful events often outgrow their long-time host facilities. In order to grow with its largest shows and meet industry demand, the City looked to an existing subterranean parking structure. With its top level at grade, the location presented a potential opportunity though its existing condition could not accommodate vertical expansion. In a creative solution that maintained parking and allowed for a 200,000 square-foot expansion, the new facility “let the dirt do the work,” a phrase used by the structural engineer. The innovative, budget-conscious design efficiently utilized the structural footprint of the previous parking structure to accommodate the vertical load with the additional support of reinforced steel trusses. The design also provides for flexible event space to accommodate any of the three traditional convention activities, enabling the Convention Center to retain growing events, attract larger functions and host more concurrent events. The lower level meeting space is situated below grade. Clerestory windows on one side of the space provide natural light—a welcome respite when event attendees often find themselves indoors ten hours a day. This level also includes six loading docks and parking. Trusses, set atop ten lower level columns, support the upper levels. The next level, at grade, features lobby/prefunction space with windows spanning the two-story space. A large portion of the space is also enhanced by interior windows that provide a panoramic overlook of the lower level meeting space. Moving up, two interstitial parking levels are situated between the event levels. The trusses weave through the parking levels and also serve to reduce noise and vibration. The uppermost level accommodates 100,000 square feet of column-free space. This important industry amenity provides additional flexibility for various event uses. A covered 10,000-square-foot exterior balcony addresses the industry’s identified desire for venues with outdoor spaces, offers views of Disney fireworks, and provides additional revenue-generating space. The interior event space addresses convention needs with 25-foot ceilings; 5,600 linear-feet of partitions that allow for flexible space configurations from one to 56 rooms; and rigging points every 10 feet that hold up to 2,000 pounds. A 12,000-square-foot, full-service kitchen can prepare 7,000 meals. Four sets of escalators, seven elevators, ten staircases, and over 30 restrooms serve event attendees; and 275 miles of cable ensure connectivity. The facility is expected to obtain a minimum LEED Silver® certification, and the City is pursuing Gold® certification. Sustainable features include EV charging stations; LED lighting; and 1,400 panes of energy efficient glass, providing natural light while reducing solar load. Meeting spaces are zoned, and each light fixture has an individually-controlled IP address. The onsite kitchen composts foot waste. Two underground retention basins were installed to filter storm water before percolating into the water table, allowing NPDES goals to be met despite the limited site size. The project was delivered in two phases. The first phase opened in Fall 2016, delivering 600 parking spaces and a climate-controlled pedestrian bridge connecting the completed parking levels to existing convention center space. The delivery of a portion of the parking was important since it returned that revenue-generating space to the Convention Center midway through construction. Already the largest convention center facility on the west coast, the expansion puts Anaheim in another category as just one of 11 US venues with more than one million square feet of exhibit space. By employing innovative solutions, the City’s expansion investment will allow the Convention Center to retain growing events, attract larger functions, and host more concurrent events. Careful and consistent coordination among the construction team, Visit Anaheim and Convention Center staff ensured that convention events were not interrupted. Relationships established with nearby hotels as well as two adjacent hotels under construction during the 30-month construction period were important and served to avoid major delays and inconveniences. More than 75 events are booked in the ACC North in the coming year and this benefits the surrounding community directly and indirectly by encouraging growth. 1,860 construction jobs were provided, more than 2,000 permanent jobs are projected, and ten new hotels are being planned. ACC North is projected to generate an additional $9 million in annual revenue that will fund vital services such as public safety, parks, libraries and neighborhood improvements. The latest Anaheim Convention Center expansion encompasses 830,000 square-feet and includes two 100,000-square-foot event halls and a 1,350-stall interstitial parking structure. Construction of the $190 million design-build project engaged more than 30 trades and as many as 350 workers onsite each day and required coordination with the construction of two hotels, multiple Disney® events, and continuous convention events with as many as 100,000 visitors during the 30-month construction schedule. ACC North, the seventh expansion to the Anaheim Convention Center encompasses 830,000 square-feet and includes two 100,000-square-foot event halls and a 1,350-stall interstitial parking structure. Faced with a built-out site and the desire to retain existing growing events and adapt to the evolving needs of the meeting and convention industry, the City invested in the innovative expansion. The project’s efficient design transformed a former subterranean parking structure, creating a unique facility that features two levels of parking between the two event hall spaces. Structural designs and innovations maximized use of the subterranean area. More than 13 million pounds of steel and 33,000 cubic yards of concrete were used to create ACC North. Construction of the $190 million design-build project engaged more than 30 trades and as many as 350 workers onsite each day and required coordination with the construction of two hotels, multiple Disney® events, and continuous convention events with as many as 100,000 visitors during the 30-month construction schedule. The designs address the evolving needs of the industry. The two large event spaces are flexible and can serve as exhibit, ballroom and meeting spaces with 5,600 linear-feet of partitions that can accommodate space configurations from one to 56 rooms. More than 1,400 panes of energy-efficient glass provide natural light and a covered 10,000-square-foot balcony space offers outdoor space—two features that address identified desires of convention attendees. Nearly 275 miles of cable ensure connectivity for visitors. The project was delivered in two phases. The first phase delivered 600 parking spaces and a climate-controlled pedestrian bridge connecting the completed parking levels to existing convention center space. The delivery of a portion of the parking was important since it returned that revenue-generating space to the Convention Center midway through construction.